Andrew offers a discount of 25% on their first / introductory lesson! A highly qualified professional musician specialising as a Teacher, Saxophonist, Clarinetist, Vocalist and Arranger. I have participated in music from an early age and I am passionate about seeing others develop their musical skills. My experience has instilled principles of hard work, resilience and teamwork and these laid a foundation for life-long learning which I am keen to model to those I teach. As a professional musician I set myself high standards in performance. Actively involved in music education for young people, through the British Army, and running local community projects and workshops, I discovered an aptitude to identify and develop musical talents in others. This experience was a rewarding part of my role. I spent 18 years in the Band of the Welsh Guards as a Saxophonist, performing music for State and Ceremonial events, displaying the high level of professional musical standards required. Events included the Royal Wedding in April 2011, The Royal Tournament 1997 and the Queen Mother’s 100th birthday celebrations 2001. My teaching experience has incorporated one to one lessons on both Saxophone and Clarinet as well as music theory with students consistently obtaining successful results in professional music examinations. I was commended by the Head of Music at Longdean School for the selfless commitment and fun I had brought to the pupil’s musical education. 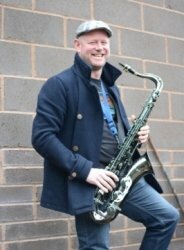 I have also performed with students in many schools across England and Australia covering all age groups and have conducted school music ensembles ranging from a full symphonic wind band to saxophone quartets and rock groups. I have given instruction on ensemble playing and instrumental lessons. A high level of professionalism and ensuring that academic standards are achieved is essential. In order to achieve this I ensure I motivate the pupils I work with by making lessons accessible and relevant to them. Inspiring creativity and full participation is also key to success. I believe in seeing the potential in every individual and building their confidence through praise and encouragement to further their skills and musical ability. I am passionate about encouraging and developing future musicians and making music accessible to all. AndrewFrom Judith (5/5): I am a mature student who has just recently taken up the saxophone again after a long break. I have had a couple of teachers in the past but I can honestly say say that Andy is the best. He expects you to put in the practice in order to improve but also makes playing fun which I believe is very important.